A few weeks ago Brooklyn asked me if I wanted to join in her series for Spring Cleaning your blog. One of the topics she mentioned was remaining true to yourself. And once I read that, I knew I had to because that has always been a sensitive and important topic for me. In fact.. so much so that I started Fashion Fits Everyone and I have another project in the works all about being you and being confident in yourself. 1. Remember why you started. Everyone starts a blog for one reason or another. For some of us the reason was to keep a journal of our life happenings so our family could be up to date. For others it is a creative outlet so we can post fashion and crafts. Someone said to me the other day, “It still makes me happy just to have a place to share my thoughts, ya know?” Yes. I do know! And that is refreshing to hear, because at the end of the day… having that place is the best reason for blogging. 2. Know your strengths. This ultimately comes back to why you started. None of us started a blog to share the things we weren’t good at. We started our blog to share things we think our worth sharing with the people around us. Let me give you a quick example from my own life. Sometimes I like to do crafts… but at the end of the day I am extremely impatient and within an hour of starting I try to figure out a crafting shortcut. By no means is crafts a strength for me… so while I will share little things I am doing sometimes, I don’t put focus there because no one wants to see instructions on how to craft a craft that is only halfway done. Ya dig? 3. Focus on your blog and not how you can achieve another blog’s status. The moment I started worrying about how to grow and how I could be like (fill in the blank) and her blog… I lost all sight of what I was writing about. It was more of, what can I write that will get readers over to my little corner of the internet? And at that point not only did I loose myself, but I lost the readers that had been extremely important to me in the first place! The ones that had supported me since the very beginning. They are more important than a million of trendy followers. 5. Don’t be too hard on yourself. There are a lot of people out there that do withhold information. They only tell you the great things. They only tell you the positive moments. They will never ever tell you when something goes wrong. Because as a society, that isn’t what we do. We want our house to be clean. Our clothing to be wrinkle free. And our hair to always be perfect. But in reality, that isn’t how it is. For anyone. So don’t be hard on yourself. You are normal. And you have a good life. 6. Build relationships. Some of my greatest friendships have come through blogging. Through people commenting on my blog and through me taking the time to go comment on other’s blogs. It is a really great opportunity to get to know someone and to build relationships. And those relationships will take you far when you are going through a “blogger rut” or when you are going through real life trials. These relationships will always be there to help build you up. I cannot tell you how many supportive texts and messages I’ve gotten over my years, and they are very special to me and helping me become the woman I am now. 7. Live in the moment. Don’t hang on to that one time no one commented on your post. Don’t hold onto that tweet that no one responded to. And do not worry if you don’t get more than 4 likes on your instagram post. When you dwell on those moments you miss out on really awesome things happening RIGHT in front of you. Today is for living and celebrating. 8. Make sure you can laugh at yourself. Being able to laugh at yourself is going to break down all the walls that are keeping you from being you. People want to see you as a human, not as a robotic princess. When you can laugh at yourself, the world laughs with you. And at those moments you will be able to show your true colors more than ever before because it digs up the realist moments in your life. 9. Let your personality shine. Once, a long time ago, my brother and sister in law asked me, “What do you want people to know about you?” I was a little confused what they were asking… After awhile I found out they were referring to my blog and facebook. They said online I was one thing and in real life I was slightly different. At that very moment I realized I was using the internet as a front to be the person I wanted to be… That isn’t cool. So I let my personality come through and gained confidence in myself. Now my online personality matches my face to face personality. In fact, my online peeps probably get more of it because no one can filter me here. 10. Have fun. That is that. HAVE FUN! Now get out there. And even if this is your job, have fun! No one said work had to be boring. 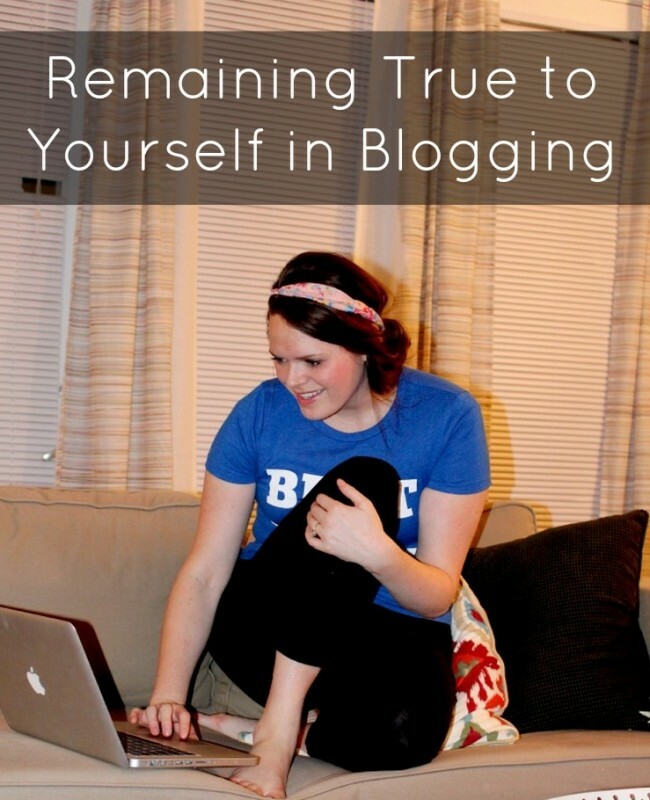 I can tell you from my own time blogging that I have learned a lot about myself because I followed these steps. And I have fallen into the trap of keeping up with the next big blogger more times than I care to admit. But at the end of the day, the choice is up to you if you want to live a life for yourself or live a life to impress others. And the only way to become confident in the person you are, is to remain true to yourself… in your writing and in your life.